Many retailers are planning to use next month's rise in VAT to "mask" more extensive price increases, a survey by accountancy group KPMG has claimed. It said 60% of retailers and consumer product manufacturers planned to increase their prices over and above the VAT rise to 20% from 17.5%. It added that across all industries, 40% of UK firms planned to do the same. KPMG spoke to 200 senior managers. 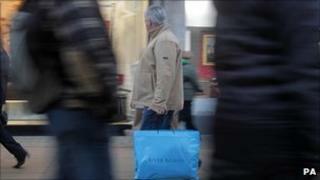 A British Retail Consortium spokesman said the report was "nonsense". Martin Scott, partner at KPMG Performance & Technology, said that as many retailers and consumer goods manufacturers had needed to discount intensively in recent years to win over wary consumers, the intention to now raise prices was "an understandable reaction". He added: "But, the timing must be right. In today's price-sensitive market, any increases may well have a damaging effect on sales volumes. Firms need to understand the overall impact on profitability." Richard Dodd, head of media at the British Retail Consortium, said 2011 would likely be even harder for UK retailers than 2010. He said: "Retailers remain in tough competition to encourage nervous customers into their shops, and so they will continue to do everything they can to keep prices as low as possible next year." A spokesman for KPMG said that all those interviewed did so anonymously. In addition to the rise in VAT which comes into effect on 4 January, retailers also have to take account of inflation when setting their prices. The most recent official figures showed that the main Consumer Prices Index level of inflation was running at 3.2% in October.